Kelly of The Unique Sheep worked with me to create this special colorway called Shadow Fire. Tolkien describes the Balrog as wreathed in shadow and flame, fire and darkness. 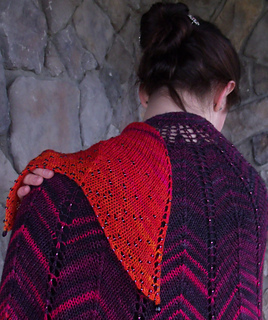 Ellen at Earthfaire is carrying special kits for this that include seed beads and this special colorway as well as an additional fabulous colorway called Dragon Fire which is also one of my favorites. About 1400 size 6/0 seed beads and 11 drop beads. Select beads that match your starting color and contrast your ending color. US Size 7 needles or size needed to obtain gauge of. You will need 20 markers, 3 markers should be different than the others.